A Traditional Neighborhood Development is the most appropriate design solution for this site. 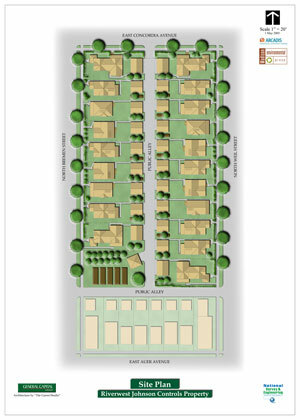 Our proposal includes 16 single-family homes and eight duplex condominium homes. The plan is flexible and addresses the environmental realities of the site. We are willing to massage our plan as we work through the details of the project with the neighborhood and City. Traditional from the outside, cutting edge on the inside. 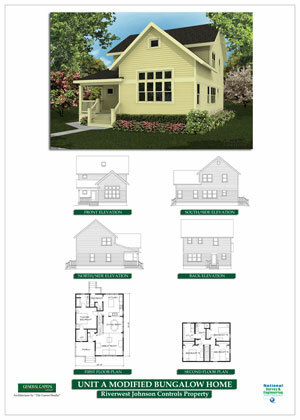 We are committed to producing homes that will achieve, at a minimum, “Green Built Home” certification. In addition, our team includes industry leaders in environmental remediation, innovative stormwater management and sustainable development. General Capital has brownfield experience. We have successfully redeveloped numerous contaminated properties and have experience bringing closure to impacted sites. Johnson Controls and the City will be working with a professional counter party that has done this before. Financial Capacity. General Capital is well known in Southeast Wisconsin as a responsive, reliable developer. While we have substantial financial capacity, we are small enough to give projects of this nature the hands-on touch. Commitment to EBE Program Goals. Our team has experience with emerging businesses and understands how to effectively tap into the resources available to accomplish EBE initiatives. We have committed to double the EBE goals of this project, or 36%. General Capital gets things done. Our firm will approach this project with the same discipline and management that has worked for us before. We believe our proposal demonstrates our experience and capacity to successfully develop this project. The following sections summarize our response the City’s RFP. We hope you will find this material helpful in your understanding of our proposal. We are committed to being good neighbors! Traditional block layout with a central alley. The layout does not attempt to invent a new pattern. Lots are approximately 40′ wide and 117′ deep, fronting Weil and Bremen Streets. A 20′ alley serves as the service spine. The alley is configured to minimize vehicular short cuts, but offer maximum convenience and access. All vehicular parking, garbage collection and mechanical equipment is oriented to the interior alley. Buildings form space and reinforce the street edge. 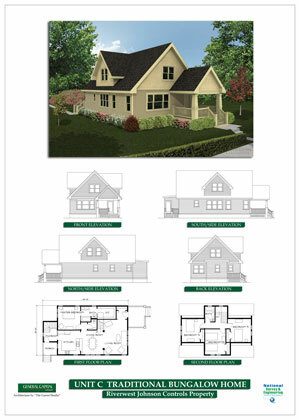 Our design establishes a “build to” line that is the same as the surrounding context. Building fronts, no matter which house type, will reinforce the existing neighborhood pattern. Part of the charm of Riverwest is its diversity of housing styles and types that are held together with the glue of a well defined street. We don’t feel its appropriate to break from this development pattern in the middle of the neighborhood. Clear delineation of public and private space. Our design clearly differentiates public and private open space. Property lines are physically defined by fences or hedges. Buildings form and protect private open space. All exterior spaces need to be understood: Who does it belong to? Who takes care of it? Who should be there? Buildings with front porches. 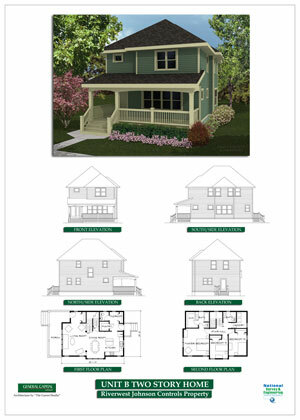 It is hard to find a house in Riverwest without a front porch. A simple element, but critical to our design. Front porches play multiple roles: a porch serves as a buffer between public and private, adds architectural interest to the street and offers a place to see neighbors and be seen. Our porches are big enough to use — they are not just an architectural cliche. Architecture responds to its context (with a twist). Our homes fit into Riverwest. 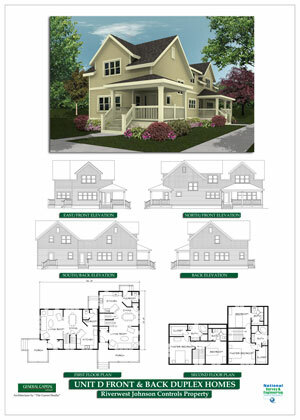 Our designs respond to the neighborhood’s traditional pattern of building massing, roof pitches and proportion. At the same time, they are not a simple mimicry of the local vernacular. Our prototypes address solar orientation, offer floor plan flexibility and include the extensive use of the latest sustainable technologies for interior and exterior building materials and systems. Compact and Flexible Floor Plans. Our prototype homes are compact by design to minimize wasted space. They are open and flexible, offering multi-use spaces and the ability to adapt the home as needs change. While individual floor plans will vary with each model type, our intent is to offer a variety of styles and price points to attract a more diverse universe of buyers. We have something to offer empty nesters, families with children and young professionals. Vibrant urban living includes a mix of incomes and lifestyles. We will strive to create this diversity in our development. Use of redundant straw bale and silt fencing in with steep slopes or areas of concentrated runoff flow. Protection of on-site storm sewer inlets with straw bales, silt fencing or equivalent measures. Save and re-use, to the extent possible with the contamination issues facing the site, all site topsoil. The civil engineer will work with ARCADIS to address soil conditions and export/fill considerations in the final design phase. Save and protect significant trees during construction (primarily street trees). Enforce BMPs with all contractors including rinsing concrete trucks in designated slab or pavement sub-base areas. MMSD’s storm water run-off regulations state that stormwater may not be released from a developed site at a rate greater than 0.15 cfs in a two-year storm event and 0.50 cfs in a 100-year storm event. Depending on the ultimate determination of pre- and post- development conditions, our project will likely require some type of detention facility to regulate the release of stormwater from the site. The size of this facility can be reduced with the use of runoff management and other techniques appropriate for this development. Promote infiltration by minimizing impervious areas and using pervious pavements or permeable pavers where possible. Promote natural water absorption, transpiration and evaporation with appropriate plantings and routing stormwater run-off from roofs and alleys through open vegetated areas. The use of bioretention devices or rain gardens. The use of rain collectors for potential irrigation purposes. Specific, drought tolerant, lower maintenance seed mixes to be used on lawns. A palette of urban tolerant, salt tolerant, lower maintenance, adaptable, deep rooted plantings. A prototypical site plan that uses trees for cooling and warming microclimates. Maintenance guidelines that discourage the overuse of phosphates, herbicides and insecticides. Although some remediation activities have occurred at the property, elevated concentrations of volatile organic compounds (VOCs) are still present in the soil and groundwater. These occur both on site and off site. The highest concentrations of VOCs are still present in the southwestern quadrant of the property. Metals and polynuclear aromatic hydrocarbons (PAHs) are also present; however, the VOC impacts represent the most significant risk factor for the site and, thus, will likely drive the site remedy and associated redevelopment. The ultimate site design must work in tandem with the remedial approach. General Capital (as well as the City/JCI) is seeking to develop this property with residential housing, which poses particular concerns and deserves careful consideration. While direct contact barriers in a project covering the entire site should be effective short term, their effectiveness (and ultimate protection of human health) may be degraded over time due to unintentional modifications and thus compromise the system. For example, residents may plant trees, install patios, or make other unanticipated changes that could penetrate the direct contact barriers and create potential health risks. Our design addresses this issue by eliminating development on the most contaminated portion of the property (southwest corner) and creating a phytoremediation zone along the alley (see appendix). Soils excavated from the development areas will be placed on the reserve quadrant, which already contains the highest concentrations of constituents. This area will then be used as a small public pocket park with raised planting beds, a community tool sharing facility and additional phytoremediation area. Excavation and off-site disposal of limited quantities of impacted soil. Targeted soils would include those excavated for foundations or utilities that could not be reused on site due to an inadequate soil balance in the site grading plan or due to poor engineering properties. Excavation and on-site management of soils where possible. These soils could be placed beneath alleys or elsewhere where human exposure risk is minimized. Application of a carbon amendment (e.g. diluted molasses solution) to stimulate the biodegradation of the chlorinated hydrocarbons in groundwater. ARCDIS has successfully used this patented remedial technology on numerous sites in Wisconsin, including with General Capital on the Washington Square Mall project. Placement of fill material with low permeability on areas of the property with elevated levels of VOCs, lead, and PAHs. Elevated VOCs are present in the western portion of the property, while elevated concentrations of lead and PAHs are present on the eastern portion of the portion of the property. Installation of vapor control systems in each residential dwelling. Systems would consist of a subslab vapor barrier and a passive venting system. These elements could be installed during construction for a relatively low cost. Basements requiring below-grade excavation are discouraged. Use of buildings, driveways, sidewalks and alleys as direct contact barriers. Placement of clean fill material and vegetative caps in green spaces (i.e., yards) to limit direct contact risks. The entire site should effectively be raised to minimize exposure pathways. Implementation of phytoremediation to treat VOC impacted groundwater. Phytoremediation is a technique where the physical, biological and chemical processes of plants are used to remediate contaminants in both soil and groundwater. With this approach, a simple planting of hybrid poplars could be used to hydraulically contain and treat the residual groundwater impacts in the “reserve quadrant.” This area could also include raised planting beds, which would eliminate the uptake of constituents from the native soil and also serve as a direct contact cap. Landscaping and Water Conservation Measures. Working together with National Survey and Engineering, the consultant will identify opportunities to incorporate native plant species and recommend techniques and designs to reduce stormwater management demands and improve runoff water quality. We, as developers, will also explore signage to educate and highlight the chosen techniques and design features. Green Building Materials. Madison Environmental Group will identify specific material options and assess cost and supply issues for a set of priority materials such as wall finishes, flooring and insulation. The consultant will identify several options ranging from “green” to “greenest.” Some of these choices will be left to the homeowner in choosing final floor finishes, paint, countertops, etc. The options will be made available to them. Construction phase waste management will include an easy to use plan for recycling wood, concrete, cardboard, white paper plans, metal, cans, bottles and other materials. Occupancy phase recycling program will include a plan to recycle above and beyond the services provided by the City. This will ultimately be a self administered program, however, an effort will be made to educate new home owners about the benefits of recycling and opportunities to recycle with neighbors. Traveler Friendly Site Plan Elements. The project will include several features to reinforce alternative transportation options. A small bike rack will be included in the rear of each house. This will offer a place to conveniently lock bikes without taking up valuable garage space. Convenient walkways will be identified to promote pedestrian connectivity to public sidewalks and the nearest bus stop. Signage including ridesharing, message posting, etc. in the community garage. Community garage facility. We propose to build a small garage on the “reserve quadrant” in the phytoremediation area to provide a place where residents can post messages, recycle and share seeds, mowers and a variety of tools. This program will be started by the developer, but its success will ultimately depend on resident participation. The goal is to set a program in motion and create the vehicle by which the community can build in any direction it sees fit. Community gardens will be included in the small pocket park. Raised planting beds will offer public planting areas. Guide to Green Living. Each new home owner will be equipped with a “how to” guide for all building systems requiring maintenance, etc., but in addition, special attention will be given to educational materials, community organizations and the like to promote green living beyond the final sale of the home. Our goal is to create a model development for JCI and the City of Milwaukee. We believe that this project can raise environmental and community awareness on a number of levels. We are committed to working with the City to further enhance our green development strategy as appropriate. Washington Square Mall. 102,000 square foot commercial property in Germantown. General Capital successfully negotiated a $1.8 million TIF to fund environmental clean up and upgrade site features. The project won a Wisconsin Environmental Working Group “Friend of the Environment” award in 2002. Berkshire — West Allis. 80-unit mixed use project in Six Points/Farmer’s Market, West Allis. General Capital approached the City with a development concept and subsequently leveraged TIF expenditures to fund the acquisition, demolition and environmental remediation of the site. Berkshire — Grafton. 66-unit independent senior housing project located on a former foundry in Downtown Grafton. General Capital won a competitive bid to develop the property. The Village proferred TIF dollars to fund environmental clean up, a reduction of impact fees and off-site streetscape improvements. The project won a 2003 Charles Edson Tax Credit Excellence Award. CVS Pharmacy (Buffalo, NY). General Capital successfully negotiated a Corrective Action Plan to facilitate the source removal and in situ remediation of VOC-impacted soils. The plan was adopted within 45 days of submission to NYDEC (currently under construction). We encourage the City and JCI to contact any of the above municipalities for references. We are proud of our reputation as a responsive, reasonable and reliable counter party. GENERAL CAPITAL OVERVIEW Michael and David Weiss formed General Capital in 1996. Steve Schnoll joined General Capital in January 1998. The original focus of the company was developing grocery-anchored shopping centers. This quickly evolved into stand-alone food stores, drug stores and industrial build-to-suits. General Capital continues to be one of the most active developers of grocery-related real estate in Wisconsin. The strength of the platform lies in our people and our long-term view. We have chosen to pursue institutional grade tenants including the Roundy’s, Great Atlantic & Pacific Tea Company, Walgreen’s, Jewel Food Stores, Osco, Barnes and Nobel, Linens and Things and Woolworth’s. We generally hold projects that we develop for the long term. While the group often considers acquisitions, our primary focus is on ground up development and redevelopment opportunities. In addition to our well-known commercial development efforts, the partners of General Capital have been involved in the development, management and ownership of various residential projects dating back to the 1980’s. Over the past several years, we have successfully developed the “Berkshire” name into a wellknown senior housing brand in the area. We have also developed speculative homes and residential subdivisions. The Riverwest project is a good fit for our platform as it will require more than just residential development expertise. THE GARRET STUDIO Paul Giesen founded The Garret Studio after years in the architecture, construction and home improvement industries. The Garret Studio will provide architectural design, green building procurement services and final design/build “move in” coordination. Prior to forming The Garret Studio, Paul was a construction manager for a major Milwaukee construction contractor, a project manager for the City of Milwaukee Housing Authority’s HOME program and an independent design/build remodeling contractor. His professional contracting experience and architectural design expertise allow him to fully appreciate home construction from the inside out. Paul will provide the team with the hands-on, human scale architectural understanding needed for this type of project. The Garret Studio was founded on the philosophy of sound traditional design principles and a focus on urban housing. Paul has designed numerous urban “TND” home prototypes and has managed numerous successful home additions and renovation projects. ARCADIS ARCADIS is one of the world’s largest environmental, facilities and infrastructure companies. Collectively, the team includes over 9,000 employees operating from 200 locations in 100 countries. In the US, ARCADIS has become one of our country’s most experienced hazardous waste firms, with a full staff of planners, scientists, engineers, architects and managers available to accomplish even the most complex remediation problem. General Capital and ARCADIS have worked cooperatively on a number of projects including those listed General Capital’s qualifications. General Capital has worked with the firm’s GRiP and patented bioremediation technologies (“In-situ Reactive Zone” injection technology) to successfully bring several brownfiled properties back to economic use. The team has an excellent rapport with local municipalities and, very importantly, with the DNR. In addition to its environmental expertise, ARCADIS has extensive sustainable development experience, including implementation of the Ford Motor Company’s extensive growth green roof and sustainability program. ARCADIS will interface with both National Survey and Madison Environmental Group to produce an integrated remediation/development strategy. Michael Maierle, P.E., will lead the remediation program for our site. We anticipate working hand-in-glove with Johnson Controls to produce an aggressive Remedial Action Plan and adaptive reuse strategy that will be acceptable to the DNR, Johnson Controls and us, the end client. Michael has extensive experience in the development and application of innovative soil and groundwater remediation technologies, Brownfield Site Assessment and Redevelopment, detailed engineering design and the management of hazardous solid waste. The General Capital/ARCADIS team is the perfect fit for this project. NATIONAL SURVEY AND ENGINEERING Founded in 1929, National Survey and Engineering is one of the largest land surveyor/civil engineering firms in the Midwest. National Survey is a division of R.A. Smith & Associates, a full-service civil engineering, surveying and technical services firm based in Brookfield. As one of Wisconsin’s leading civil engineering firms, National Survey holds in-depth experience across disciplines that includes LEEDSTM certified professionals. The firm’s team of landscape architects, land development engineers, planners and technical staff position National Survey & Engineering to be a leader in sustainable site design. The firm has produced plans for dozens of high quality housing developments through the Midwest including several conservation/smart growth plans, City of Milwaukee Brownfield sites (Trostel Square, RiverCrest, Gaslight Lofts) and numerous single-family subdivisions. National Survey’s philosophy is grounded in the belief that a logical team approach yields the best results. In this case, working with General Capital, The Garret Studio, ARCADIS and the Madison Environmental Group toward a shared vision for a high quality and sustainable site design. Ken Welden, P.E., LEEDTM –AP, will serve as primary civil engineer and sustainable site design consultant. He will also direct National Survey’s team of landscape architects. Ken has more than 12 years of civil engineering experience and is now accredited by the US Green Building Council as a LEEDTM certified civil engineer. Ken is personally interested in projects that provide both environmental and economic benefits to their constituent communities. He holds a BS in Civil Engineering from the University of Wisconsin — Milwaukee. GENERAL CAPITAL GROUP, LLP MADISON ENVIRONMENTAL GROUP Madison Environmental Group uses an interdisciplinary and inclusive approach to provide practical solutions for individuals and organizations to conserve natural and capital resources. Their outcomes are creative, practical, action oriented and measurable. The firm recently put their talents to practice and renovated their new office space using green principles. The outcome is a work environment that is healthy, flexible and productive and highlights the firm’s resourcefulness. Madison Environmental Group will consult with General Capital through the development process and recommend ways to institute green building objectives and create the best possible sustainable outcome for the project. The firm will explore and recommend building products, energy and water conservation measures and community building initiatives. Sonya Newenhouse, PhD, is Founder and President of Madison Environmental Group where she leads the creative and resourceful staff. Sonya will lead the green development consulting effort of our project. She has more than 10 years experience in qualitative method development, waste management and recycling and community outreach. She is also the President of Community Car LLC and Crescent LLC, the building home of our office, Community Car and L’Etoile Restaurant. She serves on numerous civic and environmental committees and boards. She speaks Swedish and is proficient in French.